In December 2016 the Silver Creek stewardship Initiative Committee signed off on the last stages of our Ontario Trillium Foundation grant. One of the initiatives of the project was to expand environmental education in elementary schools in Collingwood and Thornbury through a working relationship with the Nottawasaga Valley Conservation Authority, our partner in the Silver Creek project. More than 400 students grades 5 to 8, from St. Mary’s, Connaught, Mountain View, and Admiral Schools in Collingwood; Nottawa Elementary in Nottawa; and Beaver Valley Community School in Thornbury, participated in the program. The comments by staff and the written comments by students in the Silver Creek handout questionnaire demonstrated that the Trust-NVCA program has been successful. 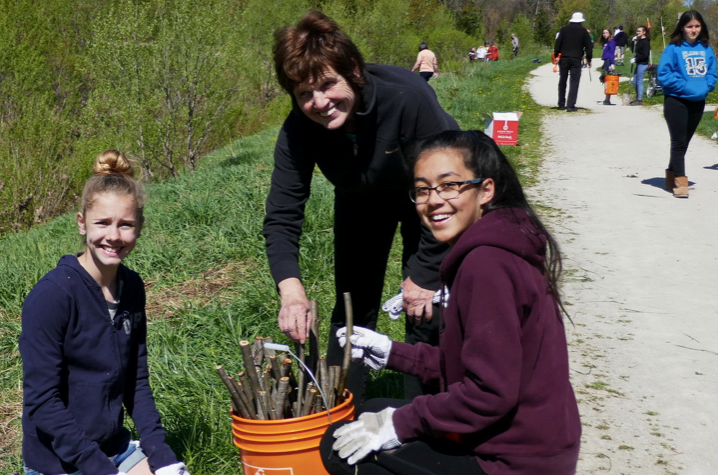 In May 2018, students from St. Mary’s took part in the Black Ash Creek tree-planting project. It was a wonderful reunion with the St. Mary’s students and it was impressive seeing them marching from the school, in a long procession of about 65 children, into the project area. NVCA’s Sarah Campbell and Fred Dobbs organized the tree-planting giving instructions and leading the work. The Trust’s Education Committee decided to expand the classroom instructions into fieldwork sessions and we have established a new partnership with the Grey Sauble Conservation Authority. The GSCA’s Program and Communication planner, Vicki Rowsell, and Stewardship technician Rebecca Ferguson, who was also our Silver Creek Initiative project manager, developed the program. Each two- hour session will have three components: Forestry, Soil Study and Stream Study. This new Elementary Environmental Education Field project begins on October 30, 2018 at the Lion’s Park in Clarksburg. The Beaver Valley Community school’s grade seven and eight students will be the first participants of this new, hands-on program. The program is supported by the Town of the Blue Mountains Sustainability Fund and eventually will be offered in Collingwood schools. The 106 student environmentalists and their Ontario Nature leaders gather for a group photo at Geneva Park.